Do you currently use Recruiting software? Recruiting software is a category of human resources management (HRM) that handles the process of posting jobs and attracting top talent for vacant positions within a company. Recruiting streamlines the entire candidate search and hiring process to make it easier for organizations to add employees. From posting jobs, to reviewing resumes and interviewing candidates, recruiting software streamlines and automates the entire candidate search and hiring process. By eliminating paperwork and offering powerful resume and candidate search functions, the software makes it easier for organizations to find and hire employees. However, nearly every HR software vendor offers recruiting features. With so many options available, choosing the best recruiting system is a daunting task. To simplify the buying process, this guide details the market, differentiating features in our recruiting software comparison, and case studies applicable to organizations of any size. There’s no denying it: the recruiting process is time-consuming. Recruiters and hiring managers face resume overload. Every application has to be sorted, ranked, and sent to the correct person for review. Candidates have to be screened, interviewed, and onboarded. It’s complex. It’s high volume. And we haven’t even covered job postings or written offers yet. Thankfully, this entire process has gone digital. Companies have replaced dated systems and paper resumes with new technology that offers social media recruiting, online assessments, and real time analytics. Now, recruiters can take a systematic approach to hiring. This not only saves time, energy, and resources, but leaves candidates with a pleasant brand experience as well. The demand for hiring software is huge and steadily growing. According to Bersin by Deloitte, HR research specialists, talent acquisition is the most important part of HR and makes up a $120+ billion worldwide market1. Additionally, the talent acquisitions systems market boasts over 400 competitive solutions for hiring, and continues to show growth of 10-12 percent 2. The market for corporate solutions alone is now over $1.5 billion in size1. The market is getting crowded with vendors offering seemingly identical functionality. As cutting edge features become standard, usability, customizations, analytics, and data management become increasingly important differentiators. 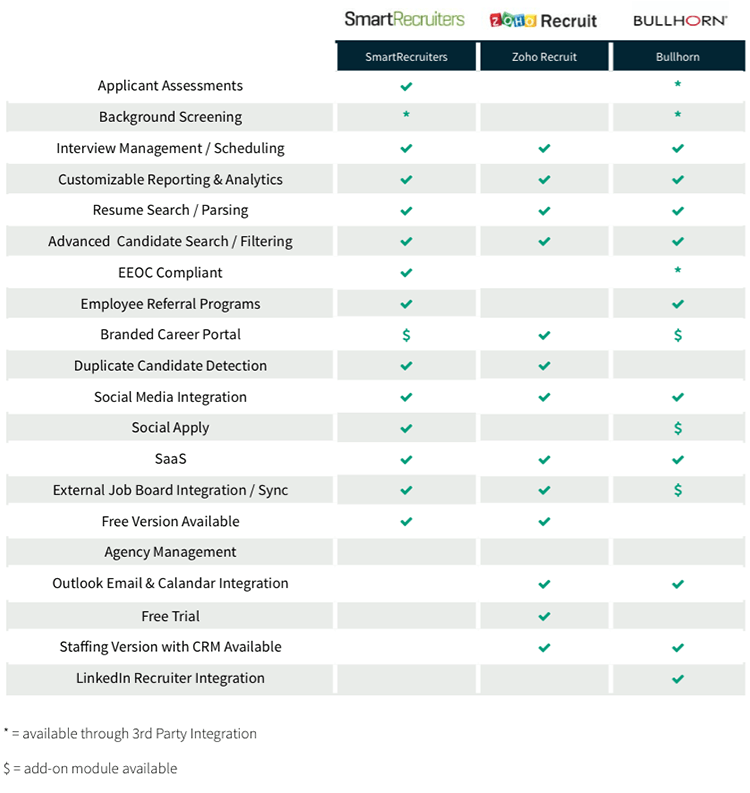 Which Recruiting Software solution is right for your business? This technology can be a key aspect of a company’s talent acquisition strategy. It provides a central location and database for all recruitment efforts. At the enterprise level, the functionality is often offered as a module of an HR suite or human capital management (HCM) system. A online database for recruiting makes it easier to narrow the number of applicants by searching for specific candidate criteria. Hiring managers can save information, customize their workflows, apply filters to searches, and ensure they are in compliance with federal employment and anti-discrimination laws. A collaborative system that aligns with a company’s internal hiring process, as well as leaves a positive experience for candidates is critical. 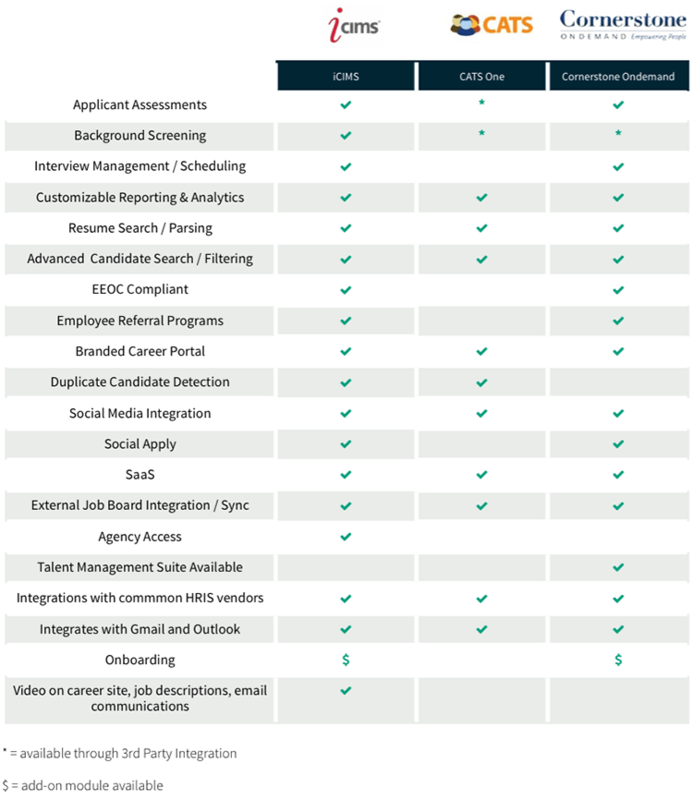 Streamlining these functions increases efficiency by screening out unqualified applicants, reducing administrative burden, and providing analytics about the entire process. With so many vendors to choose from, it’s easy to get overwhelmed. The following trends, as well as the features in our comparison charts, will help you differentiate vendors and choose the right provier for your business. Most HR software vendors are moving away from on-premise solutions, and recruiting solutions are no different. Companies are choosing to use cloud-based systems, rather than buy a one-time license and housing a system onsite. This Software-as-a-Service (SaaS) model means you pay a subscription fee (generally per month or year) in order to use the software. The solutions in this guide are divided into three categories: enterprise, agency, and small-to-medium business (SMB). However, SaaS deployments make modern software more flexible and scalable than ever before. Keep in mind that many of the vendors compared below offer tiered solutions for businesses of any size or type. As you compare vendors, one of the most important considerations is integrations. Many recruiting tools are considered best-of-breed, which means they are designed as a standalone system. If your company has existing HR systems, such as payroll software or a learning management system (LMS), then it’s important that any solution integrates with them. On the other hand, if you are looking for an all-in-one system that handles other HR processes in addition to recruiting functionality, then a vendor that offers a full HR suite will be required. One of the biggest trends in talent management is social recruiting. This means using social media platforms, such as LinkedIn, Facebook, and Twitter, for advertising, searching for passive candidates, and promoting job postings. The entire hiring process is becoming more like marketing every day. Recruiters can post targeted ads, build custom hiring websites, and create company videos. These assets are not only used to attract top talent, but provide detailed tracking and analytics as well. This makes it easier for recruiters and hiring managers to assess what talent acquisition strategies are working and adjust accordingly. Though the core functions of all solutions in this niche are the same, there is additional functionality that different business sizes and types might look for. Let’s examine some of those differentiators below. For large organizations, a recruiting system that integrates with existing HR or ERP systems is critical. In-house recruiters also need strong collaboration features that facilitate sharing applicant data and receiving feedback from hiring managers. Enterprises may also prefer a solution that offers a branded careers page, application portal, and an internal job board. These features facilitate internal hiring and employee referral programs. iCIMS is a leading provider of SaaS talent acquisition software. Founded in 1999, iCIMS is one of the fastest-growing companies in America. The New Jersey-based company now has offices on three continents and is used by the New York Public Library, GNC, Hertz, and Esurance. iCIMS Recruit is the company’s flagship product. It includes an applicant tracking system, mobile optimized recruiting portal, and robust communication and analytics tools. iCIMS offers unlimited job postings and enables candidates to apply through common social media platforms such as Facebook and LinkedIn. The software also supports employee referral programs, searching and reporting functions, and compliance with federal Equal Employment Opportunity standards. Pierpoint International is a Silicon Valley based recruitment company with a global presence. The company was selected to hire over 200 employees with varying experience levels, including executives. Consequently, Pierpoint needed a robust, affordable solution that could be swiftly implemented and configured. Pierpoint chose iCMS for their talent acquisition software. This resulted in Pierpoint hiring 100 percent of their goal in just 5 months, which amounts to 30 hires per month. Using iCIMS resulted in the company reducing their time-to-fill, improving their metrics, and impressing their leadership team. Recruiting agencies require many of the same features as enterprise businesses. However, since agencies are tasked with filling positions for clients, they need additional functionality. Agencies will need to store and search large amounts of data very easily. Advanced filtering options and email integration are both necessary. Furthermore, agencies require extra features to handle their client details, so customer relationship management (CRM) functionality should be present. SmartRecruiters is a San Francisco-based company founded in 2010. They provide software for collaborative hiring and social recruiting. SmartRecruiters’ mission is to make hiring easier and “to disrupt the entire industry.” In 2014, SmartRecruiters was a gold winner for “Best Advance in Talent Acquisition Technology” in the annual Brandon Hall Group Excellence in Innovation Award program, outperforming competing solutions on product, unique differentiators, value proposition, and measurable results. SmartRecruiters’ cloud-based platform allows companies to quickly source, engage, and hire great people. The platform gives hiring managers and recruiters tools to manage candidates, while simultaneously simplifying the application process for applicants. They offer a seamless solution with one click applications, social and mobile recruiting, Facebook hiring, and career websites. SmartRecruiters goes beyond standard recruiting systems by providing agent management specifically for recruiting agencies. This means companies can manage the recruitment process, their own recruiters, and their recruiters’ performance— all from the same system. 1-800-FLOWERS.COM is an online floral and gourmet foods gift retailer founded in 1976. The company hires up to 800 seasonal workers per year, which requires a lot of time, money, effort, and strict deadlines. Before adopting SmartRecruiters, 1-800-FLOWERS and its subsidiaries were posting to job boards without a central location to manage candidates. The company had more than 1,200 employees, six different brands to hire for, and locations across four states— with no recruiting system in place. Oliver Horvath, HR Generalist, joined the company in 2012 as a part-time employee tasked with hiring more than 600 seasonal workers. Without any formal hiring solution in place, Horvath needed a recruiting system that could unify the hiring process across different cities, states, and brands. 1-800-FLOWERS required an end-to-end system where candidates could be directed to the same place and information was easily accessible. 1-800-FLOWERS implemented SmartRecruiters and it “re-invented the entire recruiting process.” SmartRecruiters provided a collaborative hiring experience for candidates and managers, and also helped the company improve their candidate flow by 90 percent. Their hiring time, which took months to find adequate candidates previously, was reduced to just one month. 1-800-FLOWERS used SmartRecruiters’ social tools to help the company drive 30 percent more candidates. Though SMBs benefit from this technology in the same ways as their larger counterparts, they often need simpler and more economical systems. Integrating with existing systems is still important, but for growing companies, a scalable solution is necessary. For very small businesses, many vendors offer free versions with limited functionality. 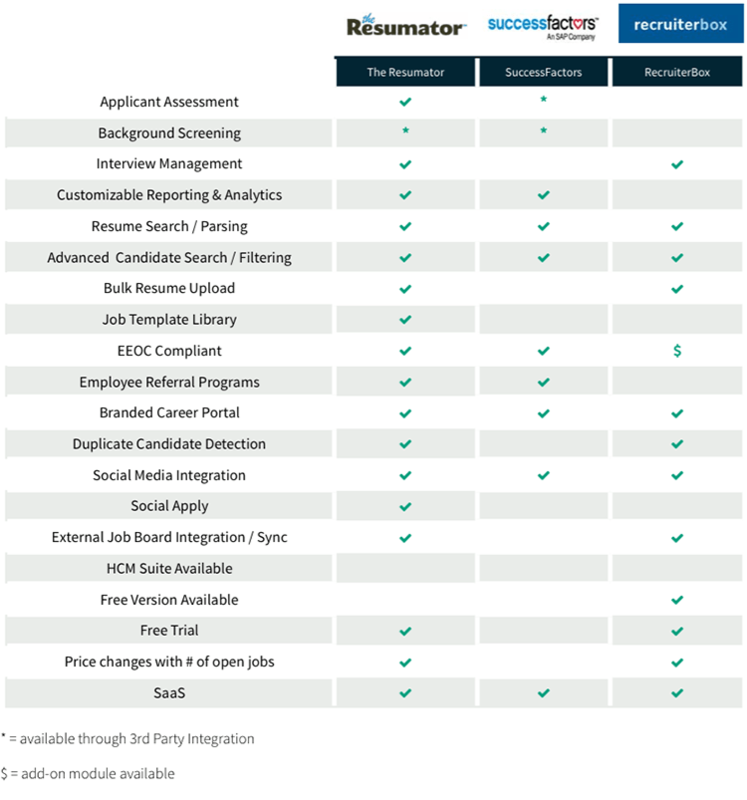 The Resumator is a leading recruiting platform that enables companies to find the best talent for your business and position. Founded in 2009, the platform helps automate and streamline the application and interview process at thousands of companies worldwide. The Resumator offers scalable workflows and real-time insights that companies can use to grow their talent. The Resumator provides a single interface for editing multiple job postings on multiple sites. This simplifies job posting by eliminating inefficient duplicate data entry. The system provides an intuitive interface, simple up-and-down voting on candidates, quick survey generation, and custom dashboards for interviews and tracking hiring metrics. It also integrates with Microsoft Outlook, so HR departments and recruiters can easily move between systems. Their mobile-friendly site allows managers or applicants to log in, update information, or apply to jobs from any device, anywhere. The Resumator also supports social recruitment and employee referrals through common social media platform integrations. uShip is the world’s largest online shipping marketplace. Founded in 2003, the company had major plans for growth, but their hiring process was unable to provide the speedy, personalized communications that many candidates expect. uShip was unable to manage the high volumes of resumes, and were concerned about losing performers due to their untimeliness. Some applicants that felt snubbed by uShip’s hiring system even left poor reviews on Glassdoor. uShip chose The Resumator to help transform their recruiting process. They implemented The Resumator’s email and reporting tools to create a tactical hiring practice that targets performers, while also promoting the uShip brand and giving the candidates a 5-star experience. uShip now provides an exceptional applicant experience, which allowed the company to regain control of its online brand reputation. The first step to finding the right provider is to identify your goals and the must-have features that will support them. Pinpointing the reasons you’re seeking recruitment software will help you define your business goals and better navigate the market. Have a list of your must-have and “nice-to-have” features. This way, if you come across two comparable vendors that meet the mandatory criteria, you have a secondary elimination method. If you come across a software package missing one of your must-haves, then it’s an automatic deal breaker. Secondly, be sure to examine vendor track records to find accreditations, case studies, and testimonials for customer service. These could be the determining factor between two similar vendors. Additionally, be sure to test drive each contender— via a demo or a free trial — before choosing a solution. You want to experience the software in action to make sure it suits your needs and isn’t masking subpar functionality behind great interfaces. Lastly, don’t be afraid to seek third-party help. At TechnologyAdvice, we help companies find the technology that best fits their business. From guides, to reviews, to product information and research articles— we’ve done the hard work for you. If you need guidance choosing a solution, free personalized product recommendations are available by phone or online via our Product Selection Tool.